I've worn knee high boots all winter every winter for I don't know how many years but this year, something's happened and they suddenly seem really frumpy. Everything I wear seems instantly more on trend if I wear ankle boots...is it just me? I decided to take a picture of today's (admittedly uninspired - I do have days like this you'll be glad to hear!) outfit with both styles of boot so you can hopefully see what I mean..
and then I quickly did an outfit with skinny jeans..
Maybe it's just me but (ignoring the Nora Batty skinnies in the second picture), I think the ankle boots elongate the legs and make them look slimmer. I also think that because ankle boots are more on trend, they have a younger look about them. The jury is still out here re skirts...I do love a close fitting knee boot......but ankle does look more modern....I will give it a try. But you look good in both! OK, I'm now agog and waiting to hear was it possible to have your knee length boots transformed into ankle ones. What a really clever idea! I have to say that I adore knee length boots ... but having said that, I think the ankle boots with your skirt was definitely a younger look. Darn it .. will have to have a serious think about this!!! I'd be interested to know if you can have ankle boots made! Had exact same thought earlier. Dug out my knee length boots to try on with my winter wardrobe and felt everything looked very dated. Think ill have to invest in new ankle boots though as my Clarks ones from last year looking bit tired. Managed to get a little dress very like your blue one from Dorothy Perkins in Awear for only €12 so will need some to go with that! It's funny that you did this post - I seem to have lived in ankle boots for quite a while and I hadn't really noticed the transition from long boots to ankle - not consciously. But it's strange that I've just read an article to say long boots are on their way back! Now what do we all do?? I prefer to wear ankle boots with short dresses but I have a few pairs which look better with midis. I think there's a boot for every occasion - so lets all go and buy more boots! Yay! How lovely to read your entry today, as this is exactly what I have been thinking about the last couple of weeks! I have been hunting ankle boots the last few weeks but have the dilemma of a flat or a heel as I have two small kids. Also, all the ankle boots that I really like are suede which is just not practical on my full time mum budget. Maybe a feature Avril on your blog on the latest ankle boots that I could take inspiration from? You look fab in yours! I have been wearing black knee length for work days, and brown riding-boot style ones or ankle boots for school run days. Hadn't even thought about it til now! I have a brilliant pair of slim mid-calf ones bought years ago that are brilliant - they fit every trned while always looking a bit different. They are so old that I am paying a fortune to keep them alive and have never seen a replacement - if you see one, please let me know!! Hi Avril - they are black and they are Ravel but from years and years ago. I remember buying them in the sale and thinking they were OK but, as they were so cheap, I would give them a go. They are so flattering - they finish exactly at the point where the leg starts to get a bit wider, so they give a lovely straight, flattering silhouette without the slightly frumpy side of knee lengths. Let me know if you spot any! have a mix of boots. I do like my black Clarks ankkle boots thougn and I do agree that they elongate your leg. I think the long boots look good with skinnies/leggings but definitely dated with dresses. I look forward to your boot blog. Have been after a tan suede western style pair for ages and have seen a lovely pair in dps at £50 and also a lovely pair in Matalan for only £20. Total bargain but need to see them in real life. 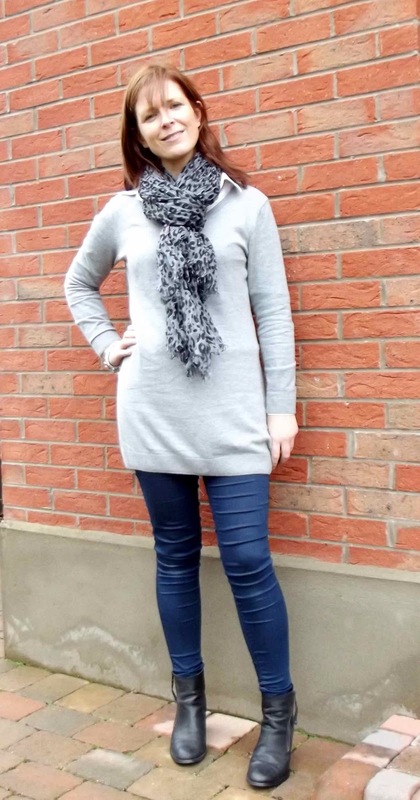 I also only have knee lengthh boots, but bought some ankle boots from Autograph at M&S last weekend and love them. YOu make me laugh, How on earth do you find the time to keep getting changed and take photos? THe knee length look lovely, much more flattering than the ankle boots and jeans, BUT i agree with everyone else, it has to be ankle boots with dresses!! I thought the ankle oots were on their way out...? DMs and longer calf length coming back - not knee length though. I love the ankle boots! I have been a loyal knee high wearer for years, especially tucking my skinnies into them, but I am feeling like they are making an already short me, look even shorter. You are slightly taller than me anyway, so can carry both off, but I think you should definitely go with the ankles this season. I am on the hunt for a good pair to update my wardrobe! Well done for braving the rain to share! I have been thinking of your write up and now am wondering if I need to get a pair or flat ankle boots. You make some compelling arguments and add photos. Interesting post. I know that ankle boots over jeans are perfectly acceptable and indeed fashionable. They also do look great when I see them on other people but on me they just don't feel right. To me long boots go over stuff and ankle boots go over stuff. Perhaps I should be brave and go out in ankle boots and jeans.